Syniverse has made great strides in building our presence and services in China over the past decade, and we recently took one special step in this effort that I’m delighted to share here. In November, our Beijing office employee association helped give back to the community by donating supplies and volunteering time to help orphaned and seriously ill children at New Day Foster Home. New Day is a nonprofit that was founded with the mission to give a loving home to orphans and provide life-saving surgery to children with special needs. Now in its 16th year, New Day has a staff of over 200 people in China and operates a 25-bed care center in Beijing as one of several that delivers specialized medical care, physical therapy, preschool education and emotional support to children from across China. 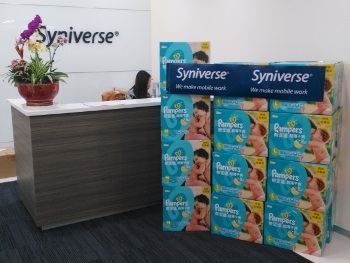 Our diaper donations are ready to go to our friends at New Day! Our participation at New Day involved almost 50 Syniverse colleagues for a day I’ll never forget. The first part of our effort consisted of collecting donations of baby clothes, toys and diapers from our office colleagues that totaled almost 40 boxes of goods. The second part included volunteering about half a day of our time at the New Day center, where we talked to and played with the children who were healthy enough to do this, and held and comforted those children who were not. The donations we brought provided much-needed goods for the center and brightened the faces of many people there, but it was our visit with the children that holds the most meaning for me. 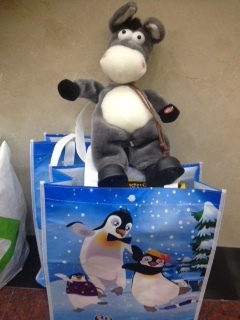 A new stuffed animal and other toy donations await some special children. As I mentioned, volunteering at this center was an experience I’ll never forget, and I think I can speak for everyone from Syniverse who was able to make the visit there in saying it was an event equally as memorable for them. The opportunity to hold, interact and play with these disadvantaged children was an experience beyond words. I will always remember these children’s faces. 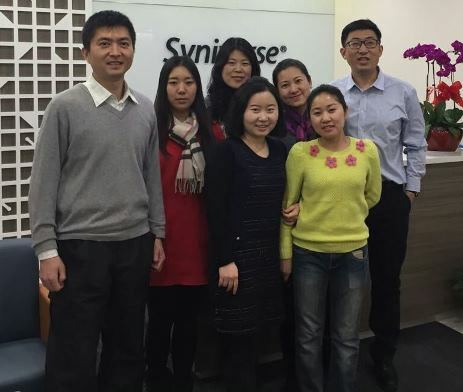 Our visit was coordinated through Syniverse’s Beijing office employee association, part of a worldwide organization that leads charitable and extracurricular activities in communities where Syniverse offices are located. Each year, many local Syniverse employee associations compile lists of charitable organizations and allow each office’s employees to vote for and select a few that that office’s employees would like to support. 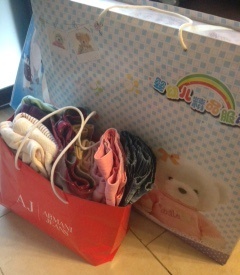 We also collected a lot of children’s clothes to donate to New Day. Our employee association’s visit at New Day is one more step in further building our presence in Greater China by giving back to the community. Syniverse has been a part of this community for over a decade and now has a team here that is 200 strong and growing. With this large team and the tremendous opportunity we have to help those less fortunate in our community, we look forward to many more events like our visit to New Day. It was an experience that was truly unforgettable. Me (left) and some members of our Beijing office team who visited New Day Foster Home. Frank is a former Sales Support Manager of Finance at Syniverse.